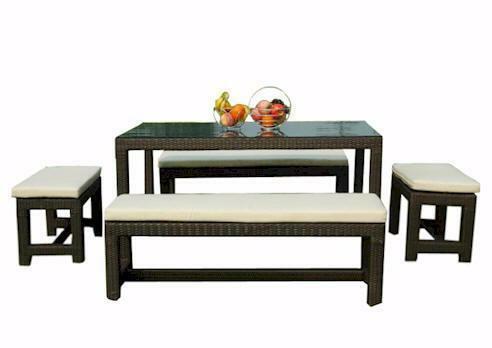 This rattan patio set is extremely durable furniture. This 5-piece dining set includes a rectangular table, 2 long benches and 2 short backless bench. The outdoor dining set features hand-selected, carefree and environmentally friendly materials that will last for years to come. The all-weather Canvas cushions are included. Color choices are Dark Green or Terracotta.